In moves to change electricity rates in California to better reflect the impacts of solar power on the grid, CPUC has allowed San Diego Gas and Electric utility time-of-use rates. This starts no earlier than December, 2017. As shown below, electricity will cost more during the peak period of 4-9 pm, but will cost much less during the spring off-peak demand period. The revised rates do not result in more money to the utility in a given year. The rates simply change how much money is collected from the various rate groups. The intent is to reduce usage during daily peak periods, to avoid running expensive peaker power plants that increase everyone’s utility bills. This will also give financial incentive for home and business battery-storage systems that can be charged with cheap off-peak power, then discharged to prevent purchasing expensive on-peak power from 4-9 pm. With most office-style businesses open until 5 p.m., and many that have a 9-80 working schedule open until 6 p.m. on most days, the final one or two hours each day will have expensive electricity. 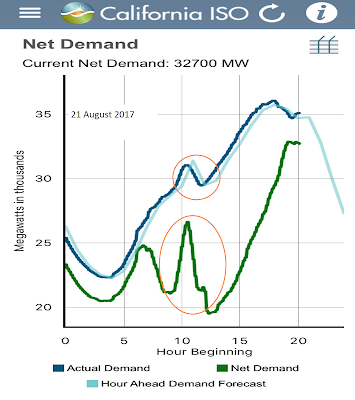 Part of the discussion at CPUC was the beneficial impact that voluntary electricity reduction had on the day of the eclipse, 8/21/2017. 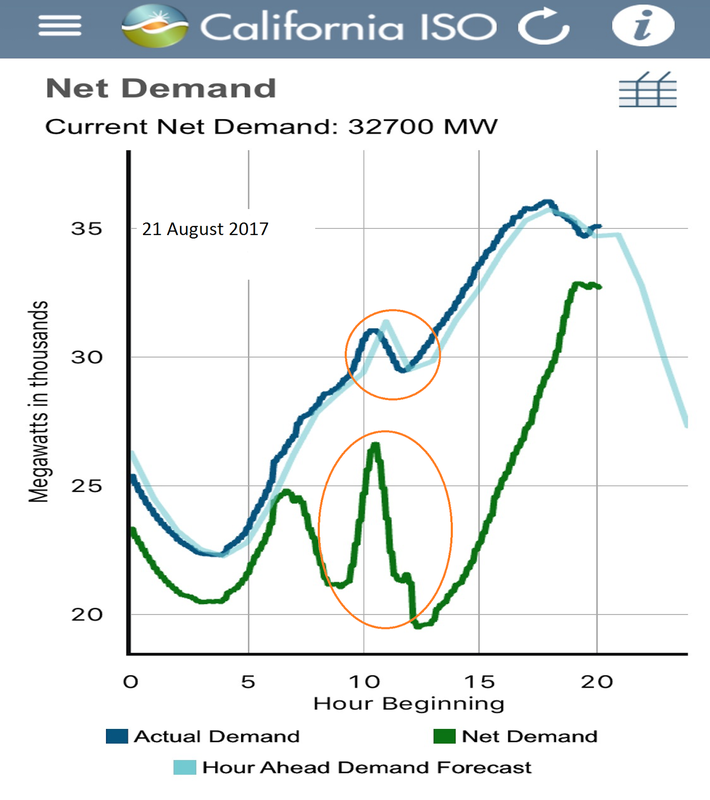 As shown in Figure 1 above, the grid demand did decline between 10 a.m. and noon. However, the eclipse peaked at around 10:30 a.m. What seems likely is that millions of Californians left work or their homes from approximately 10 a.m. to noon. The proposal voted on is available at (see link) http://docs.cpuc.ca.gov/PublishedDocs/Published/G000/M194/K473/194473384.PDF. This decision addresses the application of San Diego Gas & Electric Company (SDG&E) to establish marginal costs, allocate revenues, and design rates for service provided to its customers. The uncontested Revenue Allocation Settlement Agreement is approved; the contested Schools Settlement Agreement is not adopted. This decision establishes new time-of-use periods to reflect the changing energy market, including a later on-peak period and a spring super-off-peak period, while affirming the grandfathering provisions for eligible solar customers previously established by the California Public Utilities Commission and extending the Eligibility Grace Period for schools. The decision establishes cost recovery of distribution costs between coincident and noncoincident demand charges based on the original testimony position of the Solar Energy Industries Association and retains the current split for generation capacity costs between coincident demand and volumetric charges. The decision establishes a three-year temporary waiver of the small commercial rate load limit for current small commercial accounts where electric vehicle charging load makes up at least 50 percent of their electric load. Unless otherwise provided in this decision, the revised rates will become effective no earlier than December 1, 2017 and will allow SDG&E to collect the revenue requirement determined in Phase 1 of its 2015 General Rate Case.